Penguin Books was founded by Allen Lane, who in 1935 was Director of the publishing firm, The Bodley Head. The story goes that he was travelling by train from Exeter to London and could not find any suitable reading matter at the railway station. He realised that there was a lack of good contemporary fiction available at an affordable price. This gave him the idea to produce paperback books and sell them for 6d (about the same price as a packet of cigarettes in 1935). The first books were published in 1935. They were all reprints of biographies and novels by contemporary writers. They sold very well, and so Penguin Books became a separate company in 1936. Allen Lane wanted a trademark for his books, something which would be easy to reproduce pictorially in black and white, and which people would remember. He and his staff were apparently sitting around a table trying to think of an animal or bird which would be suitable. One story relates that it was the secretary, Joan Coles, who suggested a penguin. Another member of staff, Edward Young was sent off to the London Zoo to sketch a bird which still appears on all Penguin books to this day. 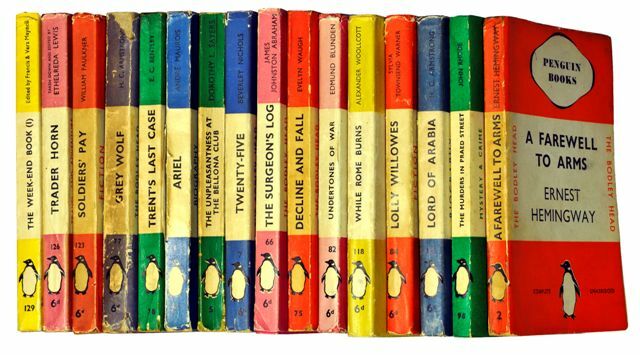 Penguin went on to publish many different series of books, including Pelicans (non-fiction), Puffins (for children) and Penguin Specials (on topical issues). Controversially, it published D. H. Lawrence's Lasy Chatterley's Lover in 1960. Allen Lane retired in 1969, and died in 1970. Since then, the company has undergone many changes, but Penguins continue to thrive and are still a major part of the British publishing industry. This set of Penguin books was collected by Dr Angus Mitchell, former Chair of the University Court. Penguin books published before 1961 (almost complete set), also some Penguin books published in the 1960s. Dr Mitchell also collected Penguin promotional material and ephemera and this material is also included in the collection along with his notes on collecting. All of the books are catalogued in the online library catalogue. Custodial history: The collection was donated to the Library by Dr Angus Mitchell, formerly Chair of the University Court. Accruals: Attempts are made to fill the small number of gaps in the collection up to 1961. Excellent resource for Penguin enthusiasts. Will eventually contain images and information about all Penguins published up to 1955.